IGCAT and the European Region of Gastronomy Platform consolidate their vision for a better future. 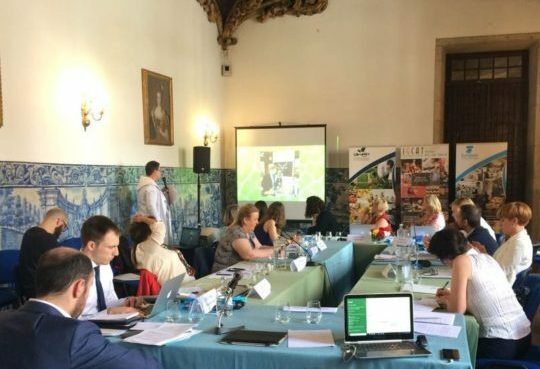 With the aim of stimulating engaging cross-cultural debate and fostering collective learning amongst the network of IGCAT experts and representatives of the European Region of Gastronomy Platform, the 5th Annual IGCAT Experts’ Meeting took place in Minho, European Region of Gastronomy awarded 2016, on 23-24 May 2018, with the support of Consórcio Minho In and under the umbrella of 2018 European Year of Cultural Heritage. Organised as the 1st International Congress of Gastronomy and Cultural Heritage, the meeting addressed the theme of Catering for a New Generation of Travellers and sought to identify possible ways in which IGCAT can have a greater impact in terms of empowering local communities, capitalising especially on the potential of younger generations. Different thematic sessions were organised, each of them identifying a specific challenge for the Regions of Gastronomy and engaging participants in a lively discussion on possible ways to tackle them, both from a global and a regional perspective, and on the supportive role that IGCAT can play in this respect. The first topic on the agenda was Global and local solutions for the protection and promotion of intangible cultural heritage, offering a special focus on how local food and food cultures can be preserved and acquire international visibility in an increasingly globalised world dominated by few, big global companies. Chaired by UNWTO Consultant and IGCAT Board member, Dr. Edith Szivas, the session explored opportunities to give a voice to regions and local SMEs and allow them to compete in a fairer world. A conversation on Distinct culture and food as the key to local development followed, devoted to highlight the importance of supporting local products in the regions, as well as local producers, especially young entrepreneurs. The discussion was chaired by Author, Consultant and IGCAT Board member, Dr. Lidia Varbanova and focused on opportunities to develop a Food Film Festival project together with the European Regions of Gastronomy. The initiative is thought to support the creation of short fictional films that promote the regions’ food, culture and landscape, as a strong medium to ensure widespread visibility of the Regions of Gastronomy and their food diversity. Managing Director of film production company Sombra Chinesa Unipessoal Lda and Assistant Professor in Communications (Film Studies) at the University of Minho, Martin Dale contributed valuable insights to the discussion. In an effort to combine the increasing demand of the young travelling generations for creative products with the promotion of cultural and food diversity as a means to support economic sustainability, a session on Rethinking traditional crafts through contemporary aesthetics and creativity took place, chaired by Responsible for Business Relations at ProAgria North Savo (Kuopio, European Region of Gastronomy awarded 2020) and IGCAT Board Member, Ilona Sares. The discussion addressed potential further developments of the Local Food Gift Challenge, an initiative conceived by IGCAT together with the Regions of Gastronomy to foster innovation in the production of food and food-related souvenirs, highlighting the significant role that young entrepreneurs can play in this field. Young chefs and entrepreneurs as influencers session underlined the potential of young people to become ambassadors of their regions and deliver creative visitor experiences. Chaired by Associate Professor at Polytechnic Institute of Viana do Castelo (Minho, European Region of Gastronomy awarded 2016) and IGCAT Board Member, Carlos Fernandes the debate served to collect valuable suggestions on how to identify Top Food Experiences in the Regions of Gastronomy which are sustainable and attractive for the international visitors. Furthermore, possible ways were explored to support young regional chef ambassadors in their effort to promote their regions cultural and food diversity. In the endeavour to enhance and strengthen cross-sectoral dialogue, for the first time botany was introduced in the discussion thanks to the contribution of Prof. Mihaela Antofie, from Lucian Blaga University (Sibiu, European Region of Gastronomy awarded 2019), who reminded IGCAT and the Platform on the importance of preserving and promoting local plant and animal diversity. Finally, the visibility of the Region of Gastronomy Award and European Region of Gastronomy Platform was discussed, in order to identify a possible joint marketing strategy to raise the international profile of the title and European Platform, with a special contribution from IGCAT Ambassador in Europe, Anton Rombouts. The meeting, which featured the participation of representatives from Slovenia and Coimbra Region, both candidate for 2021 European Region of Gastronomy title, concluded with the 5th IGCAT General Assembly, during which the organisation’s Strategy Plan for 2018-2020 was approved.